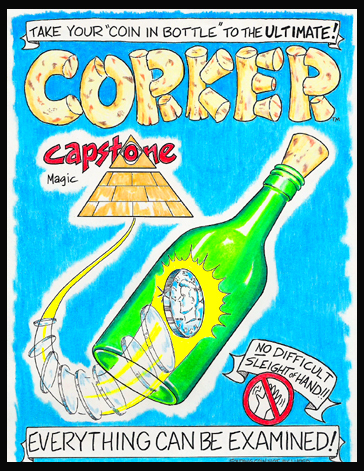 Today, when you order "Corker Coin in Bottle by Chris Capstone", you'll instantly be emailed a Penguin Magic gift certificate. You can spend it on anything you like at Penguin, just like cash. Just complete your order as normal, and within seconds you'll get an email with your gift certificate. One of the main benefits of Corker is that it eliminates the problem of switching the coin, getting it folded, and getting it into the neck of the bottle. Especially the sound issue. Also, the the dirty work is done long before the climax, so you can focus on presentation. Plus, the coin they hand you never leaves their sight before it penetrates the bottle. This is a huge advantage over other Coin in Bottle versions. I was building a Coin in Bottle Routine and needed a way to get the coin loaded into the bottle in full view of the audience without having to fumble around in a pocket or keep my hand around the neck of the bottle. Corker was the best solution I could find and has worked flawlessly for me over the years. It's not for everyone, nor for every situation. But it met my needs perfectly. I usually don't write reviews for products I don't like. I really don't like this one at all. The product works as advertised but if you try and use a half-dollar version of a coin in bottle gimmick it won't fit. Also, the design of the cork is like one I haven't seen before so it looks weird. In stead of using this version, I'll be making my own. Im a bit torn on this one, firstly you should know that you will require another gimmick to be able to use this trick and secondly this gimmick is not examinable (although they do provide a non-gimmicked version to switch and hand out to your audience). I would suggest that there are better methods of apparently putting a coin in a bottle, but if the concept of using a cork makes sense to you then it could be worth checking out!